Ford resumed civilian production of its half-ton pickup trucks for the 1945 model year, though it made fewer than 20,000 of them. 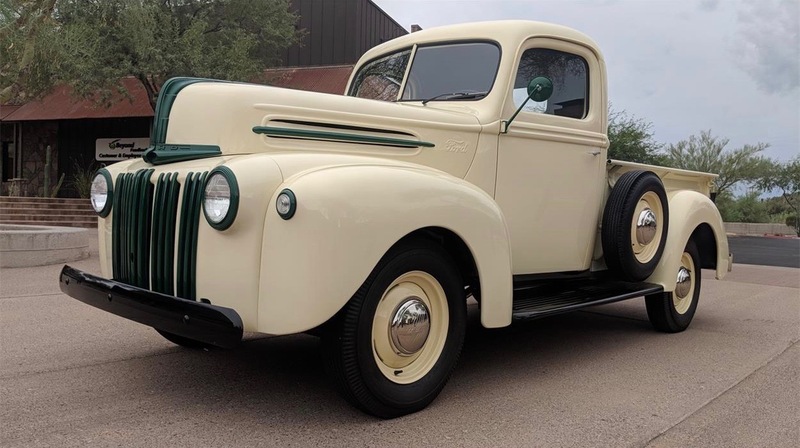 One of those trucks, a 1945 Ford pickup presented with blacked out chrome trim as was done for World War II, is Pick of the Day. 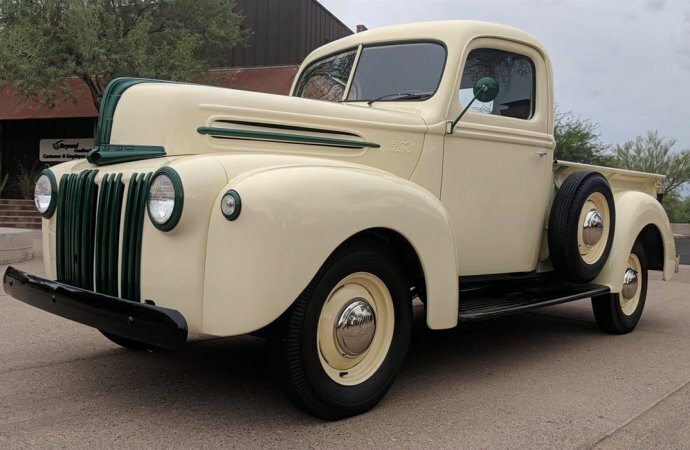 Advertised by a private seller on ClassicCars.com, the truck was “meticulously restored starting in 2013 and finished in 2016 by order of the Ford dealership,” presumably Fremont Motors of Scottsbluff, Nebraska. The seller reports the truck was displayed at the dealership. 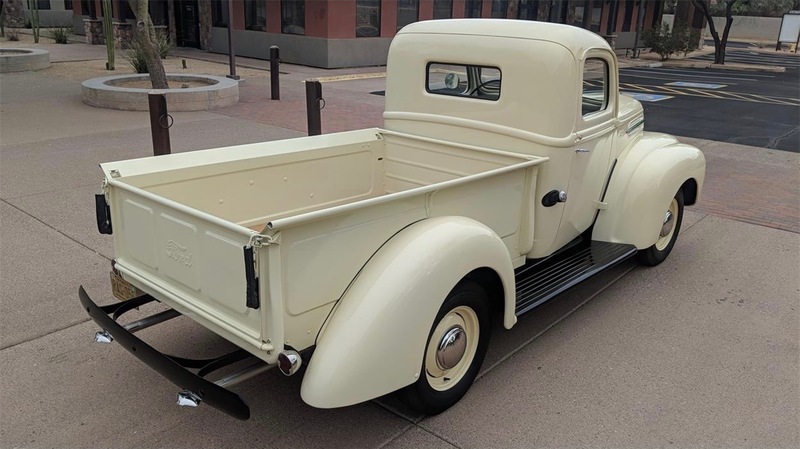 “This truck could only be obtained by a special letter to the war department for civilian use,” the seller says. “Inspection shows flawless paint, fit finish and gaps, with an absolute rust-free body with no visible signs of rust repair,” the seller says. “The brakes have just been freshened up with all brand-new wheel cylinders, master cylinder, and shoes. 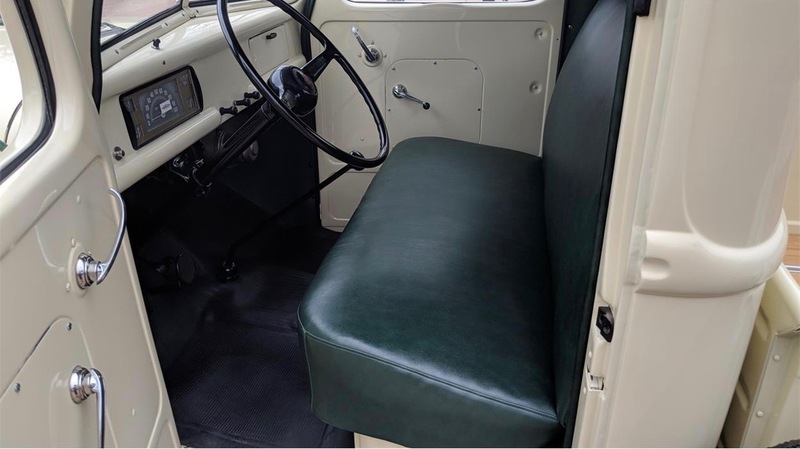 The truck is beige with green interior, a Ford flathead V8 and manual transmission. The truck is located in North Scottsdale, Arizona, and is advertised for $59,000. Is that an 8BA engine? I thought that engines of that time would have water exiting the heads at the top front corner. And hard to tell where the distributor is. Pre-’49s had the distributor driven directly off the camshaft end. Just asking . 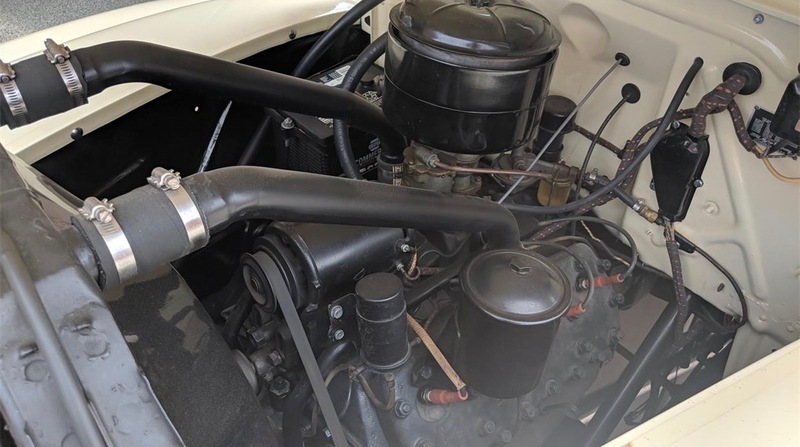 . .
1949 was the first year for the front of head radiator hose connection, and up top distributor. I love this truck and its chrome absence. The tailpipes seem incorrect no? Los automoviles post-guerra no datan de 1946 en adelante ?? saludos. Eugenio Daniel: Algunas camionetas ya fueron construidas en 1945 (Dodge, Ford, GMC, Studebaker), y también 1944 (Chevy). Los camiones más grandes reanudaron la producción en 1944, y algunos de ellos nunca cesaron de producir durante la guerra. International construyó algunas camionetas durante la guerra también. Los carros de pasajeros cesaron su producción en febrero de 1942 y se reanudaron para el año modelo 1946. Pero a algunos autos de 1942 no se les permitió venderlos de inmediato y se almacenaron para su venta más adelante. Esto dio lugar a que algunos automóviles llevaran los documentos de registro de 1943, 1944 y 1945. Actualmente estoy escribiendo un libro sobre este tema.